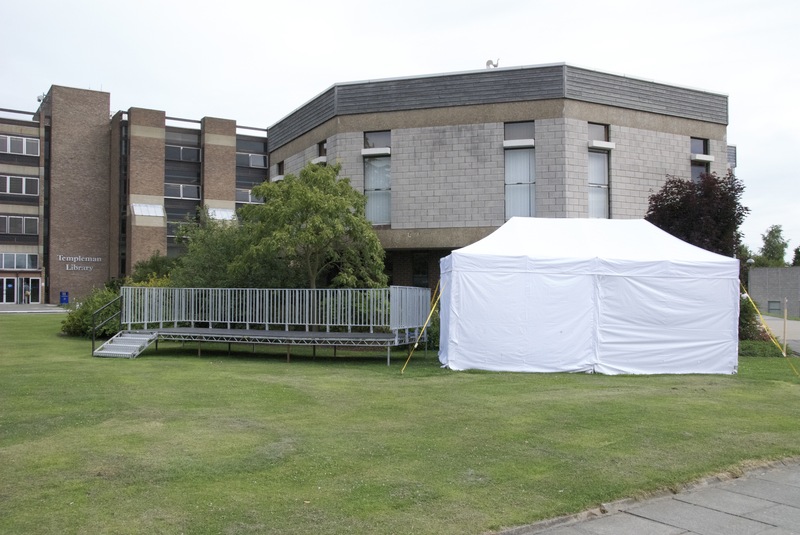 Yesterday I wrote about Dave Walker’s tent here at the Lambeth Conference. As you may recall, he is serving as (I am not making this up) “Cartoonist in residence.” That’s surely a good thing. He has put a picture of his tent up over on his blog. His photo conveniently does not show something else very well. What is that stage to the left of his tent? I think Dave is about to become “Dancer and singer in residence” also. I can think of no other plausible explanation for this stage so close to his tent. I met him in person today, and he did not mention this stage. That lack of a denial is just as good as an admission, as far as bloggers are concerns. While I had said I wasn’t going to post news here, this is a big story. I’ll be following it closely. If the official cartoonist becomes a dancer OR a singer, watch for the breaking news exclusively here in 7WD. And the problem with the poet in residence interpreting his work through dance and song would be . . .?? ?